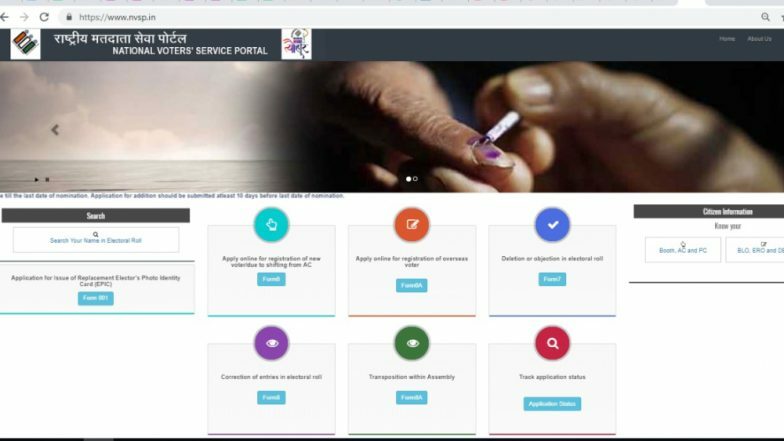 Screenshot of National Voter's Service Portal. New Delhi, March 25: With the dates for phase-wise elections for Lok Sabha are out, people have started figuring out where is their voter card and are there any mistakes persists, which might hinder them from exercising their democratic right! Among the most common mistake in the voter card is the address of people, printed in the voter id card. Considering the point that most of the Indians travel and change their secondary addresses for survival, they end up in losing the opportunity to cast their vote. It has also become difficult for people to change the address in their voter id every time. However, there is a simple way to update the address in voter’s ID through www.nvsp.in, so that the glitches while voting is sorted. VVPAT Full Form And Functions: All FAQs Answered on VVPAT Machines And How They Will Work With EVMs in Lok Sabha Elections 2019; Watch Video. www.nvsp.in is a website of Election Commission through which an existing voter can update his/her address, name, date of birth, his/her guardian’s name, age, and gender. Through this website a person can apply for replacement of Elector’s Photo Identity Card (EPIC), registration of new voter/due to shifting from AC, registration of overseas voter, deletion/objection in electoral roll, corrections of entries in EPIC, transportation within assembly and track application status. Type www.nvsp.in in the search engine bar of your browser. The website of Election Commission will open which will automatically lead you to the correction form window. Click on the ‘Correction of entries in electoral roll’ (form 8). This will open https://www.nvsp.in/Forms/Forms/form8. Choose the language section (Hindi/English) on the right side of the window. Fill in the initial particulars like State, District and Parliamentary Constituency. Then fill in the applicant’s name. To get the part number and the serial number of the electoral poll, open a new tab on the browser https://electoralsearch.in/. Fill in the details sought there. Or you can search by EPIC number. After filling the requisite area, click the ‘view details’ tab on the corner left, and a new tab will open showing you the details of part number and serial number of the electoral poll. Note down the number. Come back to https://www.nvsp.in/Forms/Forms/form8?lang=en-GB and fill those blanks space with appropriate details. Tick the address section. Fill in the particulars. After every detail is filled, press the submit button and soon you will get an SMS from ECI on your registered number, with a reference number. With this number one can track the status of the application. Though ECI might take days for correction, since the process is tedious and involves the authentication of submitted documents, we advise the aspirant voter to wait and keep checking the NVSP website.